Make sure students are trained in their parish or school using age appropriate resources from the Diocese. Enter the training data (date, time, numbers trained, etc.) in the new platform at https://stcloud.cmgconnect.org by going to Children’s Data>Add New and filling in the fields. NOTE: Choose “Other” for the ‘Program Name’ using the drop down menu, and, in the ‘Notes’, put “Barbara Sinatra Training” for Grades K-6 or “Josh Shipp Training” for Grades 7-12. Parents may sign a form to opt out of this training, but they assume the task of addressing this important topic at home. Have their background checked every 5 years, first required when s/he begins. Go through the training, to be synced with the renewal of background checks. We moved to a new platform for Adult Training, Background Checks and the submission of Student Training beginning August of 2018. Site Administrators should already have received information about this. We will update this page as we all learn the system, and answer questions as they come up. Of course, you may always contact Catholic Education Ministries at 320-251-0111 with questions. Watch one of the Webinars, the second is better, but missing a couple of minutes at the beginning. All of your staff and volunteers over 18 will need training this year (those under 18 should do the Student Training for their age level). People with recent background checks over the last 4 years will have accounts already. They will save money because they do not currently need a background check and their training is shorter, since they will wait to do the full training when their next background check is due. Site Admins can find their usernames by clicking on Users>All Users on the left. Don’t forget they may be under a different parish or school. You can search the entire diocese by using the Search User in Diocese field. People with accounts will be doing the “RENEWAL TRAINING – A Safe Side of the Line (St Cloud)” which does NOT include a background check. Since parishes and schools will receive an invoice for background checks, we don’t want people to have them done until it is time for another check. New staff and those whose Background Checks are up for renewal will need to “Register for a New Account” and take the training entitled “Safe Environment Training, Policy Acknowledgement, and Background Check (St Cloud)” which ends with the Background Check portal. Ask your staff and volunteers to log into their accounts at https://stcloud.cmgconnect.org and do the training and background check when it comes due. Submit the counts of students trained when that is completed. Archive people on your list who are no longer active. And you are done. The system then does the Annual Compliance Report for you. Log in to your account (username for most of you would be your email address) at https://stcloud.cmgconnect.org. Familiarize yourself with the admin and user guides under Resources. It is worth watching one of the two recorded webinars (they are basically the same). Browse (Eyeball) to see background check, training, and other data. Edit (Paper and Pen) to edit some of your user’s profile data. Archive (Red Button) to remove folks from your list. You can un-archive them (i.e. restore them) as needed. To add people from other parishes/schools: Note the Search User in Diocese button to find those whose main site is another parish or school. Click on that to do the search. Then click on the Star to add them to your Secondary List, which you can view by going to Users>Secondary User List. Be trained in their parish or school using age appropriate resources from the Diocese. Annually read the Sexual Misconduct Policy (as part of training). Annually read the Ethics and Integrity Guidelines (as part of training). Annually watch the short training video and fill in the requested data, remembering to click “Submit” when done online. Make sure students are trained every year and take a count of K-6 graders and 7-12 graders. Make sure staff/volunteer Background Checks are up to date before they engage in their ministries. Make sure staff/volunteers take the Annual Training online or face to face. Document the numbers of students trained and staff/volunteer names, background check dates, training dates, and other data and then fill out the Excel formatted Annual Compliance Report (XLS). Email the report to Terry Voigt at tvoigt@gw.stcdio.org in Excel format by June 30th. Print out that same report, have the pastor review and sign it, and file the paper at the parish/school indefinitely. This is important in case, years later, it is necessary to show that someone was trained annually and had the appropriate background check done every five years. Student materials can be found in your Safe Environment Binder that should be in your Parish or School. This year use ‘Year A’. For more information on the materials, see the Safe Environment Training for Students Page. Training must take place yearly. A count of student attendance should be added to the Annual Compliance Report (XLS). Please enter only the total number of students in the ‘# of Participants’ cells. Parents who do not want training for their children and youth must complete a Declination Statement (DOC). They are asked to talk with their children about safety. Resources for parents are in the Student Training Binder. Background checks need to be done every five years for people who work regularly with youth and/or vulnerable adults. The background checks should be done, of course, before they begin. The forms are below, and also included on the Adult Training page so they can print them out, sign them, and bring them to you. You will receive a monthly list of your staff and volunteers with their background check dates to monitor when they are due for renewal and so, at fiscal year’s end, you can copy and paste their dates into the Annual Compliance Report (XLS). Have your volunteers sign and return to you the VOLUNTEER Background Check Release Form (PDF) every five years. Background checks for volunteers are processed by MYB (Mind Your Business). Have your staff sign and return to you the PAID STAFF Background Check Release Form (PDF) every five years. These background checks are processed by MN-BCA (Minnesota Bureau of Criminal Apprehension). Include payment of $3.50 each for Volunteers and $8.00 each for Paid Staff. Make the check payable to the Diocese of Saint Cloud and mail it with the signed forms to: Reverend Robert Rolfes, The Chancery, PO Box 1248, Saint Cloud, MN 56302. Adults working with youth and/or vulnerable adults need to engage in training every year. The training may be done ONLINE or FACE to FACE. Trainees should go to Adult Training at http://stcdio.org/about/safe-environment/safeenvironmenttraining/ where they will read the Sexual Misconduct Policy, the Ethics and Integrity Guidelines, and watch the video. They will then fill in the questionnaire blanks and click “Submit.” Watch a video on how to do it here. Checking “Yes” to “Did you read, understand, and agree to conduct yourself in accordance with the Sexual Misconduct Policy?” and “Did you read, understand, and agree to conduct yourself in accordance with the Ethics and Integrity Guidelines?” is considered the same as signing the questionnaire that face to face trainees fill out. 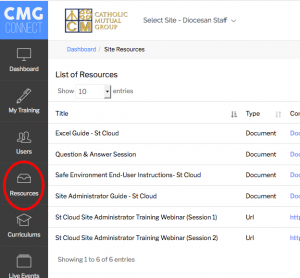 Parish and School Safe Environment Contact people may view a list of online trainees at any time by going to http://stcdio.org/safe-training and logging in with the credentials obtained from Catholic Education Ministries at 320-251-0111. Watch a video on how to do it here. And the Ethics and Integrity Guidelines. Face to face trainees may view the video individually or in a group by going to the Safe Environment Training page at http://stcdio.org/about/safe-environment/safeenvironmenttraining/. Facilitators can show the video from a computer on its screen or use a projector for groups, and conduct a discussion afterward if they like. Note that the video can be viewed full screen by clicking on the fullscreen icon on the bottom right of the video. The training video may also be downloaded to your computer by right clicking here (MP4) and selecting Save As…, Save Target As…, or Save Link as… depending on your browser. The trainees will then fill out the questionnaire that can be downloaded in a Word (DOC) or PDF version and then printed out. Collect them for own parish/school records. As volunteers or staff join after the training, they may do the Online Training if they like. Whether the training is done Online or Face to Face or a combination of both, trainees need to be listed in the Annual Compliance Report (XLS) and emailed to Terry Voigt at tvoigt@gw.stcdio.org no later than June 30. Remember, the Annual Compliance Report includes the Student Training Report. Watch a video on how to do it here. Download the Annual Compliance Report (XLS). Fill in the Student Training numbers, dates and any declination information. 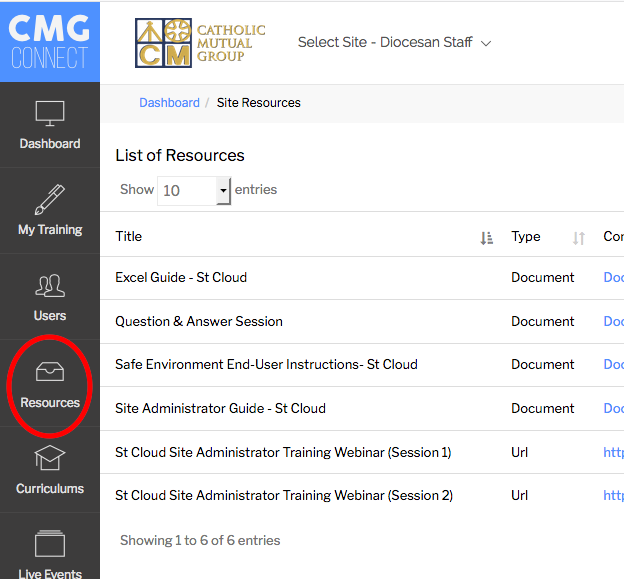 If some or all of your people took the online training, download their information in Excel format from http://stcdio.org/safe-training by logging in and then click on the “Report” menu command. Catholic Education Ministries, 320-251-0111, has given your parish or school a log-in name and password. Once logged in, you will see a list of the trainees displayed for quick reference and a menu item called “Report” that allows you to download the list in an Excel file. Copy and paste (paste special>values is cleaner) the information (except the answers to the video question) from the Excel file your downloaded into the Annual Compliance Report (XLS). Video instructions for viewing and downloading online trainee information may be viewed here. For any names not entered online, please type them into the Annual Compliance Report (XLS) and enter the information. Note that, under ministry types, “Educator” refers to Catholic school principals or teachers. Tips on streamlining how you enter the information into the Excel spreadsheet can be viewed here. Email a copy of the Annual Compliance Report Spreadsheet (Excel format), which includes the Student Training Report, to Terry Voigt at tvoigt@gw.stcdio.org no later than June 30. Print out the Compliance Report Spreadsheet and have your pastor sign it. This printed and signed copy is for your records and should be kept indefinitely for documentation purposes for years ahead. Note: The preferred method is to email us the Annual Compliance Report in its Excel format. We import the data from the Excel spreadsheet into a program for the Auditors. If need be, mail the printout to: Reverend Robert Rolfes, The Chancery, PO Box 1248, Saint Cloud, MN 56302.